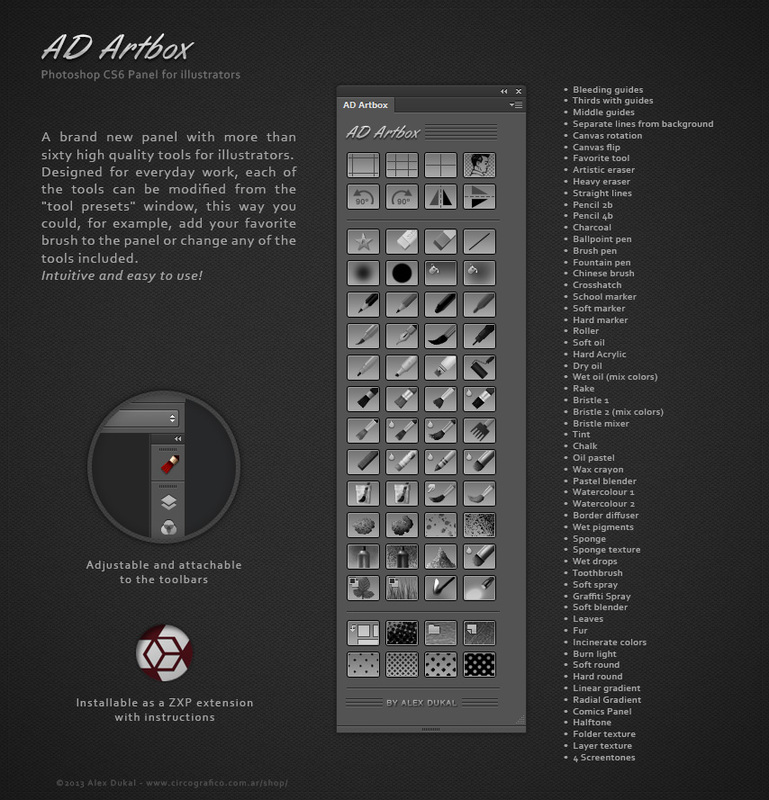 AD Artbox it’s a new Photoshop CS6 Panel with more than sixty high quality tools for illustrators. Designed for everyday work, each of the tools can be modified from the “tool presets” window, this way you could, for example, add your favorite brush to the panel or change any of the tools included. Intuitive and easy to use! with 4 and 16 GB RAM. to help whenever its possible and necessary. There are no refunds. I highly recommend to TRY the AD Artbox lite before purchase this full version. *Mercado Pago hará -al momento de recibir el pago- el cambio de dólares a pesos argentinos automáticamente, tomando el cambio oficial del día. Hola Alex, en primer lugar felicitarte por tu trabajo y agradecerte infinitamente todos los regalos que nos has estado haciendo estos últimos años en forma de herramientas que nos facilitan el trabajo y nos aportan altas dosis de inspiración y creatividad. Acabo de adquirir el AD Artbox y realizado el pago, ¿Cómo descargo ahora el programa?, ¿Me lo enviais al correo?, disculpa por la ignorancia pero es que desconozco el método. Luego de concretar el pago recibirás un correo con el link para descargar el panel, en la misma dirección de e-mail que ingresaste aquí. Recomiendo revisar la carpeta de Spam si el mensaje no llega inmediatamente. Ducal muchas gracias tu aporte me ha devuelto mi fe y amor al arte, muchas gracias en otro momento adquiero el panel completo gracias. 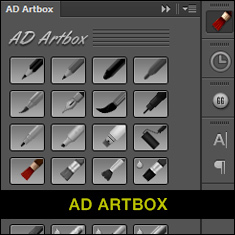 The AD Artbox Panel is a panel for PS CS6, so it is not compatible with CC. “AD Artbox it’s a new Photoshop CS6 Panel. NOTE: AD Artbox and AD Artbox lite have been intensively tested, but are distributed without any warranty more than the willingness to help whenever its possible and necessary. There are no refunds. it’s going to be downloable. Hope soon! The command “Select” is not currently available. I have read page 12 of your user manual where it addresses this problem, but I don’t understand your solution. What do you mean by “Artbox requires three sets of tools: Patterns, Actions and Preset Tools loaded”? How do I load them? 1. The ERROR: The command “Select” is not currently available”, is a common thing in Photoshop, not a trouble with the panel. Just open the Tool presets window and uncheck the “Current tool only” option. if -for any reason- you delete or move that files the panel will not work. Also, when you load the panel in Photoshop, it search and load that three files in PS (AD patterns, actions and tool presets), so if you replace or delete any of those files while working with the panel, you are going to receive error messages. Eg. If you are using the panel and want to load other actions, don’t use the option “Replace actions”, just “Load actions”. The same for the patterns and for the tool presets. Hope this answer your questions! 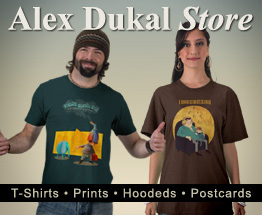 Hola Alex! estoy intetando comprar el pack, pero no me lo permite paypal por ser dos cuentas argentinas. Hay alguna otra forma de realizar el pago? gracias!